There are some books that change you. Some books that no matter how many books you read after, they will always stand out. The False Prince was one of these. When an artist– song writer, author, movie maker– puts out something incredible, there’s always the skepticism that the follow up cannot possibly surpass the greatness of the original. That’s why Oceans 11 is awesome and Oceans 13…not so much. This is completely not the case with Jennifer A Nielsen’s series. I read the False Prince because Carolyn recommended it so highly and I always want books that will engage the students, especially those reluctant readers. It was every bit as good as Carolyn had said. The students decided that we absolutely must read The Runaway King immediately after. I gave them other choices (all the while wanting them to choose The Runaway King) but it was a unanimous decision–we needed to know what happened to Sage/Jaron. We fell into The Runaway King so far that we may or may not have skipped a few math lessons. When students are telling you: “We will work extra hard if you just read us one more chapter”, it is really difficult to say no. So I didn’t. And today we finished the book. We were all excited because yesterday we looked at the Scholastic order and saw that The Shadow Throne (the third in the trilogy) is now out. When we finished today, I immediately said, I will order the next one today. One of the students, who can often be hard to engage, said, “Can you order it right now so you don’t forget?” That– is what a book should do. It should make you forget that other things exist, keep you on the edge of your seat, root for, cry with, and grieve with the characters as though they are your friends.That’s what The Runaway King does. At the end of The False Prince, Jaron has accepted his title as King of Carthya. We know more is coming but it was a good wrap up to the wonderful story of how Jaron made it back to the throne. The Runaway King not only showed a maturing of our main character, it expected the reader to mature as well. The stakes, the intrigue, the deception, the pace, and the connection deepened in this book to an amazing degree. I am always in complete awe of writers that can pull you this far into a story, write in a way that makes you think there is absolutely no way for the character to come out of the hole they are in, but then, in the most unexpected and beautiful ways, the story goes where it obviously meant to. Nielsen is an incredibly gifted story teller. She manages to show an understanding of the insecurity and uncertainty that a normal fourteen year old boy would feel after losing his family and compounds it with the immense weight that is put on Jaron’s shoulders. He must fight not only the people that want to take Carthya from him, but people that are supposed to be his loyal supporters and subjects. The very interesting thing to me is that the kids are usually wary of any love interest at this age (you get a lot of ‘ews’ from grade fives if there are any mushy scenes) but the friendship that forms between Imogen and Jaron is so much more than just your typical boy likes girl, girl likes boy, they can’t be together story. Imogen is Jaron’s person. So you root for him to be with her (or I did- the students probably enjoyed the dueling with pirates more than anything) but then there’s Araminda, the betrothed princess. In many stories, it’s easy to choose: I want the character to choose X. It’s not cut and dry for Jaron though because Nielsen does such a wonderful job creating likable characters that we can’t dislike Araminda any more than we can help like Imogen. She has the rare ability to make you like a character you were sure you hated. This story has everything: friendship, heartbreak, action, bravery, suspense, love, betrayal. Sage/Jaron is one of the best characters I’ve ever known. He is funny, humble, frustrating, and honorable. He is the flawed protagonist that anyone who is a writer wishes they could write. He is a King but the kids can see themselves in him– in his choices and his hardships, in the loyalty he has to his friends and the loneliness that often swamps him. There are no dragons or wizards, underworlds, demigods, or alternate universes, but still, this book was completely magical. There’s nothing better than enjoying a terrific book while on holidays and I had the good fortune to tuck The False Prince into my bag when we went away last month. We were headed camping and our beach site was gorgeous. It wasn’t long before I sat down on and entered the captivating world of The False Prince. King Eckbert, Queen Erin and Crown Prince Darius all die under very mysterious circumstances and one of their noblemen initiates devious plan. His intention is to substitute an orphan for the king’s long lost son and only remaining heir. Conner envisions the orphan will impersonate Prince Jaron, return “home” and ascend to the throne. Once installed, he imagines the orphan will have no choice but to do his bidding. Conner scoops up four orphans from the streets and takes them to his vast residence. Once there, they share a room as they learn to sword fight and ride horses. The boys are schooled in King Eckbert’s family history and are taught to read. In short, Conner will not be satisfied until each of the boys learns to behave as a prince should. Sage is the most outspoken and defiant of the orphans. He challenges and annoys Conner whilst outwitting the other potential impostors. Sage moves about secret passageways while his rivals are sleeping and he is punished repeatedly for his misdeeds. 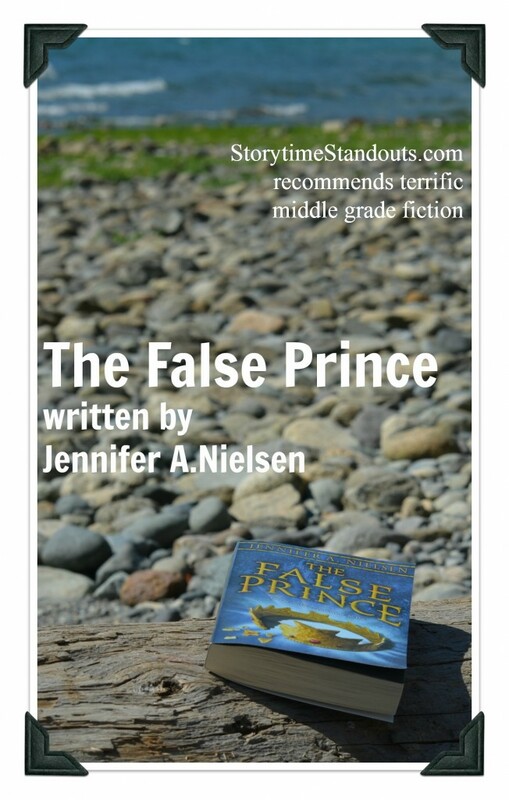 Well suited to middle grade readers, including reluctant readers, The False Prince is an exciting, accessible fantasy/adventure that will have special appeal for boys. Highly recommended. The False Prince is available in hardcover, paperback, audiobook and ebook formats. Magic Johnson. Albert Einstein. Cher. John Lennon. John F. Kennedy. Hans Christian Anderson. Orlando Bloom. Tom Cruise. Johnny. These people have a few things in common. They have a presence, they made a difference, and, for a variety of reasons, didn’t love to read. For some, Orlando Bloom and Tom Cruise, reading was difficult. Learning Disabilities affect not only a child’s ability to read but their confidence in doing so. Though it may be true for many of these well-known individuals, it is not always a learning disability that affects a child’s desire to read. For Johnny, it was lack of interest, not ability. For others, it’s lack of time or exposure. Though he’s not a basketball player, a singer, or an inventor (as far as I know) Johnny has something in common with all of these people. Though he said at the beginning of the year that he would rather do anything other than read, he made a great effort. He will be remembered by me and by his classmates because, despite his aversion to reading, he stood out in the class. He embraced his own attitude and felt good about himself. He was also open-minded enough to try new books and authors. He had enough presence in our classroom that the other reluctant readers were willing to try as well. That matters. It’s hard to believe we’re at the end of the road for this school year. This will, in fact, be my final entry about Johnny. I’ve enjoyed watching him unfold as a student and as a reluctant reader. I don’t know that we turned him around entirely. He claims that he still does not love school or reading and would much rather ride his bike. However, with less and less prompting and suggestions each month, Johnny has managed to read more than a half a dozen books since September. Not only that, but two days ago he came to me and showed me his latest library book: Lunch Money. I had no part in him choosing this book. In fact, when I told him that I had some other students who LOVED Andrew Clements, he said, “Well my friend told me it was good so I’m reading a book he liked and he’s reading one I suggested”. And I thought, wow. Johnny and his friend, two hockey boys who like to goof around and have fun, had a conversation at some point that entailed each of them sharing their thoughts on a book and recommending one they enjoyed to each other. To me, that seems like an excellent place to “part ways” on this journey. I say that rather than “conclude” the journey because Johnny is going to wander a different path now, one toward grade six and I am going to get a whole new group in September. But I hope that Johnny’s path will continue to include reading and that he feels good about the reading accomplishments he made this year. I hope that he becomes less and less reluctant over time to pick up a book and fall into it. Even if he doesn’t I hope he thinks back about this year and realizes that his willingness to try regardless was stronger than his reluctance to read. That too, matters. If everybody who works at school is so smart, how come they can’t get rid of the bullies? How come when it comes to bullies, kids are mostly on their own? Jake has given bullying considerable thought. He has decided that he attracts bullies because of his size (he is not too big), the fact he does not have an older sibling, his unwillingness to tattle and the intellectual challenge he represents. Jake is excited to start grade two and all is well until Link Baxter joins the class. Initially Link torments Jake by shaking his desk during a handwriting lesson. Classroom trouble soon moves to the school bus and Jake is understandably upset by the time he arrives home from school. His younger sister Abby encourages Jake to think about the bully. She points out, Its not fun to feel mean. Overnight Jake strategizes and decides to “play it cool.” He will not react to Link’s taunting and teasing. He will not show Link that he is bothered. Jake’s plan works until Link takes his bullying to another level and pours water on the front of Jake’s pants. Jake is so angry that his hits his enemy, is sent to the office and must rethink his strategy. Jake Drake Bully Buster will have considerable appeal for both boys and girls. Author Andrew Clements’ approach, having Jake reflect on all the bullying he has experienced and trying different responses, is very effective. Readers will recognize bullying techniques and will learn a variety of ways to effectively deal with bullying. 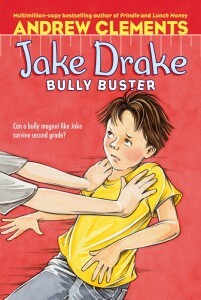 Jake Drake Bully Buster is an 80 page, illustrated chapter book that is best suited to children in grades two to four. There are four titles in the Jake Drake series. Post reading questions and activities from WITS The WITS Program brings together schools, families and communities to help elementary school children deal with bullying and peer victimization. When eight-year-old Matthew and his mom move from their rural home to the West End neighborhood of Vancouver, Matthew is forced to leave his beloved dog behind. Matthew’s grandparents will care for Lucky as he and his mom establish themselves in a downtown apartment building that does not allow pets. Matthew begins school and tries to adjust to city life but he misses his pet terribly. He is hopeful that, before long, they will move again and be reunited with Lucky. One night, after settling for sleep, Matthew hears a familiar sound; he is sure there is something under his bed. Moments later, he feels a rough tongue, licking his cheek. Some refer to ‘Fred’ as an imaginary dog but, for Matthew, he is very real indeed. It is not long before the apartment landlord is convinced that Matthew is hiding a pet in the apartment. This generously illustrated, eleven chapter book will be thoroughly enjoyed by boys and girls aged seven to nine. I particularly appreciated the realistic portrayal of the relationship between Matthew and his mother; Matthew wanting Lucky to live with the family, his mother unable to find an apartment that will allow the dog. Her nervousness in dealing with an wary apartment manager and the compassion of neighbors all contribute to making No Pets Allowed a good choice for young readers. Measle and the Wrathmonk is one of my new favourite chapter book series for middle grade readers. Ten year old Measle lives a deplorable life. He is hungry most of the time, he is fifthy and lives in a wretched house with a menacing guardian. He has been told that his parents were killed by a snake but Measle is unconvinced and hopes he will be reunited one day. Although the set up of Measle and the Wrathmonk seems all too familiar (orphaned child, deplorable conditions), Ogilvy creates unexpected and exciting twists and turns that are sure to engage young readers. Measle is a winner and well worth trying with reluctant readers. Additional books in the series include Measle and the Dragodon, Measle and the Mallockee. Visit our page about reluctant readers for more information. Graphic novels are similar to comic books in that they rely heavily on illustrations to tell much of the story. Graphic novels often appeal to reluctant readers but they are equally enjoyed by those who are fluent. Bone and Babymouse are both currently very popular graphic novel series for children. Babymouse is clearly intended primarily for girls and is good fun. Amulet by Kazu Kibuishi is a new series. My ten year old son and I each read Book One, The Stonekeeper. I read the book first and then he picked it up and devoured it shortly thereafter. The story begins with a dramatic and tragic car accident that apparently kills Emily and Navin’s father. Two years later, depleted finances force the family to move into a home that has been empty ever since Great Grandpa mysteriously disappeared. It is not long before the children find themselves on a desperate quest to save their mother from a tentacled creature she encounters in the basement. My son and I both enjoyed the book – he more than I. The author/illustrator does a terrific job of setting up further adventures. He leaves many questions unanswered and will undoubtedly draw readers to subsequent books in the series. I feel I would be remiss if I did not comment on the death scene midway through the book. Neither of my sons (aged 10 and 12) found the illustrations of a dying and then dead man remarkable. I’m not sure what that says about their de-sensitization thanks to movies and video games. Anyhow, I was surprised to see the man, eyes wide open, followed by another frame wherein a character closed his eyes and a third frame where his dead body was covered with a sheet (pages 110 – 112 in my copy). My boys were very matter of fact about the illustrations. Take a look for yourself and post your thoughts. 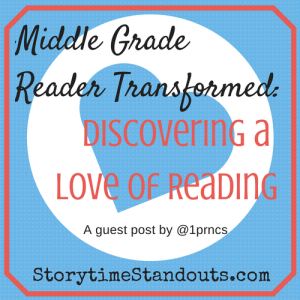 You may be interested in our page about reluctant readers. This past weekend, my son’s teacher loaned me a copy of Mystery in the Frozen Lands by Martyn Godfrey. He has ordered a class set of the book and his grade 4/5 class will be reading it later this year. What a great choice! It was very refreshing to read historical fiction – I’ve been reading so much fantasy of late. Mystery in the Frozen Lands is set in the mid 1900’s and is told from the perspective of a fourteen year old boy: Peter Griffin. Peter is anxious to learn what happened to his uncle, Sir John Franklin. Franklin departed England twelve years earlier, in search of the Northwest Passage. Neither he nor his crew of 128 men returned. Quite apart from creating an captivating mystery with respect to Franklin’s disappearance, Mr. Godfrey tells of the terrible hardships endured on a voyage of this kind. While enjoying the very readable story, we learn a great deal about life as a ship’s boy and especially the cruel Arctic Winter. Atom Rep (Hockey) tryouts are underway. Stinky gear is airing in my otherwise attractive front hall. meals and activities are carefully planned and pressure mounts as my youngest son attempts to “make” the top team in his division. It won’t be easy but we are cautiously optimistic that he will be successful. To be honest, I’m hoping this year the rep try-outs will be more efficient than last when we drove him to the rink eleven times before learning which team he would play on. He had a fantastic season and really wants to play for the same coach this year… My fingers are crossed. As summer winds down, I’m not really mentally prepared for the start of winter activities. Pulling my warm jacket out of the closet just doesn’t seem right. But, since nine-year-old thoughts have already turned to hockey, we picked up Scholastic Canada’s Book of Hockey Lists. It is a perfect choice for hockey-hungry nine-year-olds. We’ve checked out lists of player accomplishments, milestones, quotes and all sorts of interesting hockey trivia. The author, Paul Romanuk knows his audience and has scored a winner with this title. Barnstormers’ Baseball, Will this Author Hit a Home Run Yet? 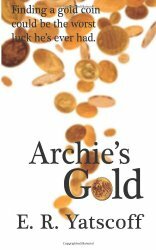 A while back, I had an opportunity to read and listen to the first book in a new historical fiction series for 7 -10 year olds. Game 1 (Barnstormers) introduces three siblings who travel with a barnstorming baseball team, The Travelin’ Nine. Set in 1899, the first book in the series leaves us with more questions than answers: we know the children’s father died in the war and that he possessed a mysterious baseball but it unclear why the ball is significant. We also hear their uncle’s warning that great danger lies ahead but so far have only encountered mysterious visions and sounds. For children who are fascinated with baseball and how it was played 100+ years ago,this series may yet prove very appealing. Personally, I was frustrated that the author left me stranded on second base – with many, many unanswered questions. Over the past couple of weeks, I’ve put aside the picture books and early chapter books and read two interesting books for middle grade readers that feature time travel. 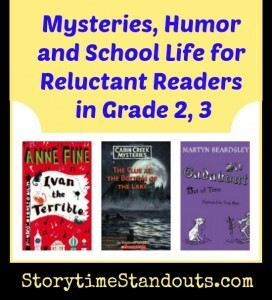 Suggested for children in grades six through nine, also referred to as middle grade readers, I have some reservations about the age range but enjoyed each of the books thoroughly. In London Calling by Edward Bloor, the central character is a seventh grade student at a private school in New Jersey. Hating school and disconnected from his family, Martin is sleeping his life away. When his grandmother dies, he is bequeathed a beautiful Philco Deluxe Art Deco radio. After he “started sleeping with the radio on … A boy – small,thin, dressed in mud-brown clothes – leaned out from behind the radio and whispered, “Johnny, will you help me?”. As much as I enjoyed the book, I’m just not sure some of the nuances will have meaning for middle grade readers aged 12, 13, 14. Is an allusion like this appropriate or necessary for a book intended for children in grades six through nine? ABC Canada Literacy Foundation has identified ‘three potential reading slump times that can hinder a child’s reading development. ‘ Grade four is one of those times. Grade four is just about the time that readers encounter longer chapters, smaller print and more complex vocabulary. We lose some readers in the transition. 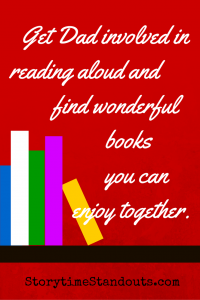 My two boys are nine and twelve – one loves to read and one loves to “do” so I know that finding engaging books is critical for this age group. 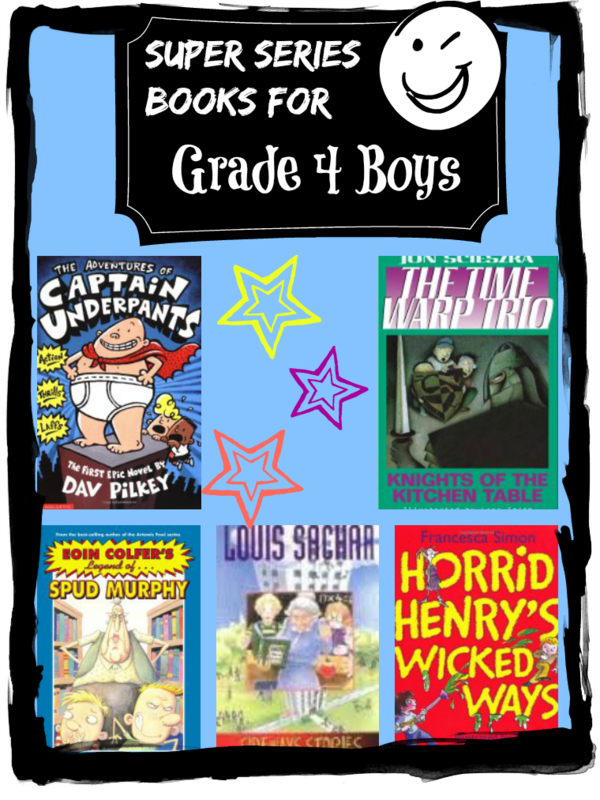 As well, I probably read more kids’ books than most moms so I’m often asked for book recommendations for grade four boys. Many of the best series for this age group are funny (occasionally rude), action-packed, irreverent and very generously illustrated. The books often feature boys who find themselves in trouble – at school, at home, sometimes even in the library. With nine, ten and eleven year old reluctant readers, we need to keep our goal in mind: get books (almost any books!) into their hands and encourage them to read. Concurrently, in an ideal world, parents will continue to read aloud more challenging and diverse books – but that is for another day. I have had great success with this book. The wacky humor and very short chapters are very appealing to boys. Each chapter tells about one student at Wayside School – you don’t have to read them in order so kids can jump around the book if they wish. Have you ever met a boy who didn’t enjoy the ‘Action, Thrills, and Laffs of a Captain Underpants book? With rude humor and tons of illustrations, this series is great for even the most reluctant reader. Just don’t tell your boys that the series is mom approved – that would spoil the fun! When Will and Marty Woodman are told they must spend the summer in Spud Murphy’s Library, they know it will be a dangerous assignment. They’ve heard about the ‘gas-powered spud gun she keeps under her desk.’ Really good fun and a positive message about books and reading! One of my nine year old’s favorites, Horrid Henry really is ‘awesomely wicked.’ It is the perfect antidote when you’ve had a rough day and you long to hear about someone who can relate to your troubles. Featuring time travel, adventure, humor and a touch of fantasy, The Time Warp Trio is a great pick for grade four boys. Sam, Fred and Joe use The Book to travel through time from one exciting adventure to another. I’ve had very good success drawing boys into this series. There is something for everyone: pirates, knights, neanderthals and Egyptians. There are so many terrific books that I usually don’t bother to comment on those that disappoint. I’d much rather write about winners than losers……but, I’ll make an exception this time. Last evening I picked up Sigmund Brouwer’s Timberwolf Hunt. My youngest boy plays ice hockey and I was interested to see how this writer approached the subject. Intended for readers aged 7 to 9, this easy-to-read chapter book opens with a hockey dressing room practical joke and includes a comment that, “Santa Claus is not real.” It is unclear why the character makes this declaration. There are no other references to Santa Claus in the book. My question is, why bother? Before long, we meet a fill-in coach, whose son will play on the team so long as his dad is in charge. As one might expect, his son does not play ice hockey well and is not welcomed onto the team. Very quickly we learn that Coach Elwell doesn’t like to be interrupted nor does he put up with back talk. Unintentionally victimized by the aforementioned practical joke, he benches two Timberwolf players. When frustrated, he is not above kicking garbage cans or yelling at his hapless son. Gosh, our kids deserve better than this. I know rude humor appeals to many boys (I’m raising two of them! ), but this is ridiculous. For the record, I vote for books that depict volunteer coaches as hardworking, caring individuals who want only the best for the team (that’s the type of coach we’ve encountered). I also appreciate a book that celebrates accomplishments achieved through teamwork and effort. Authors who create funny situations are so much more clever than those who stoop to the same sad, odourous joke over and over again. Leave this one to gather dust on the shelf. Back when I was a firefighter, the chief discovered I was a writer with a short story published. He volunteered me for a children’s reading week at a district school. I walked in the school gym and mingled with several other neighborhood people who had volunteered. Since I was in full dress uniform I got all the attention from the elementary students. What surprised me were the comments of the children regarding firefighters: “Firemen can read?” “Is that really your name in that book?” Apparently firefighters were illiterate sorts, Neanderthals, who couldn’t read or write. Most of the children told me their fathers didn’t read books; “only the paper.” Many of my male friends and ex-colleagues have rarely cracked a book. Could it be they never found anything interesting to read while growing up? Few firefighters write books. There’s plenty of non-fiction in Canada written by them but no fiction. I’m the only one in Canada writing eBook mysteries featuring a firefighter. Unfortunately it’s an adult book. Whenever school and children’s groups toured my fire station there was always a definite level of excitement. The older the group, such as Boy Scouts, the higher the interest. To keep this interest going, with regards to books, there was little around, save for picture books. A chapter book/juvenile novel with firefighters and fire trucks could continue to build on the excitement. Literary books are a tough sell for boys. In my situation, I’ve written several juvenile/middle grade novels yet it’s never occurred to me to write one about firefighters. The high interest angle is essential to attract children, especially boys, to books. Perhaps a few firefighter novels in the genre would turn on more boy readers and therefore more men readers. I was at a provincial park in Saskatchewan several years ago and watched a mixed group of tweens goofing around near the beach on a hot day. One boy sat on the grass reading. What kind of book could keep a boy away out of the sun and water? I walked over to him and saw it was a Harry Potter novel. That’s when I realized the power of attraction in those books. Thank you J.K. Rowling. 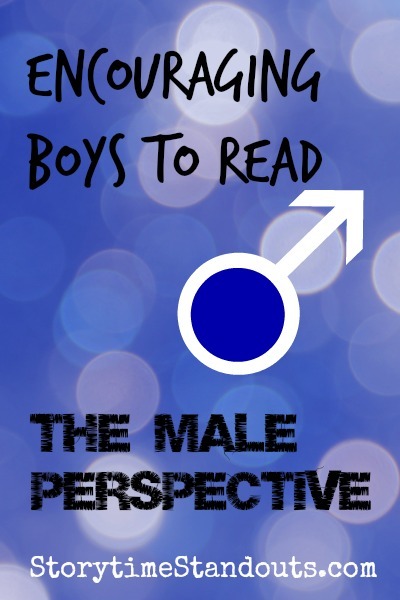 The Male Perspective – Encouraging Boys to Read was written by Edward Yatscoff. Retired fire captain with Edmonton Fire Rescue. Widely traveled. Have won several writing competitions and awards for short stories. My writing credits include travel articles, short stories, non-fiction, and mystery novels ranging from juvenile/middle grade to adult. I’ve written the very first firefighter mystery in Canada in an eBook. For this momentous achievement I can hear one hand clapping. I manage a writers group in Beaumont, AB. Hobbies include fishing and camping, boating, home renos, and writing. I’d really like to take credit for the fact that both my boys love a good book. My almost-twelve-year-old is a enthusiastic reader. He is currently reading one of the Lord of the Rings books. He is especially fond of history and knows far more about World War II than I do. Most of the information has been gained through reading; fiction, non fiction, magazines and newspapers. My younger boy (9 years) is more of a “doer” than a “reader” but he knows a great story when he hears one and we still make time to share a book or a puzzle at bedtime. I read books aloud to the boys from the time they were six months old. 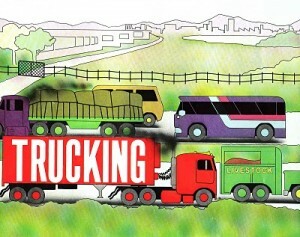 We trekked to storytime at the library and were constantly borrowing books “about trucks.” There is little doubt that I was the one who planted the reading seed and carried enough stacks of books back and forth, to and from the library, to nourish it. I’ve always had an interest in children’s literature and read J.K. Rowling’s Harry Potter for myself when the boys were toddlers. Just a few years later, reading the first Harry Potter book to the boys was truly magical. We all loved the experience as a family but there was one particular moment I will always remember. My husband was headed out of town for a week and was most concerned that he might miss hearing part of the story read aloud. He cautioned us that we were not “allowed” to read ahead while he was away – he couldn’t bear the thought that he might miss even one minute of the read aloud experience. The boys and I solved the problem by rereading four or five chapters of Harry Potter and then we all charged ahead when my husband returned. I will always be grateful for the message my husband gave his boys; he has always been eager to enjoy a good book with them (another favorite series was Kenneth Oppel’s Silverwing). But that particular incident was evidence of just how important reading with the boys is to him. It is not at all unusual for parents of preteens to be frustrated by their boys’ lack of interest in reading. To those parents, I would say, get Dad involved in reading aloud and find wonderful books you can enjoy together. In some families, mom always reads the bedtime stories from a very young age. 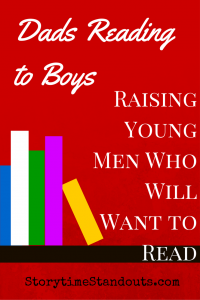 It can be very beneficial to change this up and for boys to observe men reading and enjoying great books. After all, we’d like our sons to choose to sit down with a great book from time to time. Additional information about Dads Reading to Children from Brigham Young University. Jim Trelease has inspired many, many adults to ramp up the read aloud experience for their children and students. Though children have to read, they don’t have to love reading. In fact, I have at least one student every year that insists they do not love it. Some even tell me they hate it. This is my favourite challenge of the school year. Watching a middle grade reader make the transition from reading for necessity to reading for pleasure is, quite simply, awesome. With the school year fast approaching, I’m wondering who that student will be this year? Which books will hook him/her? What made him/her dislike reading? How difficult will it be to change his/her mind? Maybe it’s my own love of reading, of character rich stories, that makes me need to see this transition take place. I want all of my students to enjoy books, to learn from them, and to feel connected with them. But it’s those kids that think they can’t find enjoyment in a book, that see reading as a chore, that intrigue me. I am very fortunate that my own daughters have inherited a love of literature. We foster that love by having books everywhere in our house, reading on our own and with them, and taking them to the library and book stores simply to browse. It must be something more than this, however, that hooks children on reading because I have many friends and colleagues that do the same with their children, yet reading is not their child’s first choice of activity. For me, books are about the characters and their journey. If I don’t connect to the characters, I’m likely to give up on the book. Children are no different; if we cannot find something that captures their attention, almost immediately, they are likely to give up. If we want to engage children in reading for pleasure, we have to know them well enough to push them in the right direction. To me, this means two things: finding books that interest our children and finding books that are at the correct reading level. and Harry Potter . So to this end, I am eternally grateful for the graphic novel. Vivid, bright pictures appeal to most people. Graphic novels remind me of great advertisements; they are designed to draw you in and make you feel like you need to know more. They capture the reader’s attention quickly, move at a fast pace, and yet they still retain the story elements that are part of regular novels. I am amazed by the amount of graphic novels available in a variety of age ranges. There are so many great series, such as Nancy Drew , Bone , Diary of a Wimpy Kid , and Amulet . You can find graphic novels that teach history and science or tell tales of favorite super-heroes. This is a huge market and it gets bigger every day. Kids are drawn to the way stories are told in speech bubbles and brief text boxes. 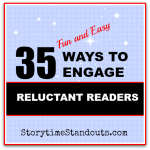 For the reluctant reader, this genre can make reading at a lower level more appealing and less intimidating, while still managing to fit within socially acceptable appearances. That is not to say this is the best or the only form of getting kids on board with reading. In fact, it’s important to remember that getting a kid to love reading is going to depend entirely on the child in question. If the interest starts with reading the subtitles in non-fiction while looking at pictures or flipping through Ripley’s Believe It Or Not , so be it. Once they begin gravitating toward reading and changing their feelings toward the activity, making further inroads becomes easier. It’s not always the case that students that don’t like to read are ‘low’ in this area. They may read quite well at grade level or above and simply not enjoy the task. Regardless of the ability or background reasons, I still feel compelled to at least try to change their minds. I guess it’s natural that when we really love or enjoy something, we want to share it with others. Equally natural, is the desire to become involved in activities that excite others. The students can’t help but sense my enthusiasm for reading and perhaps, that in itself, is the hook. I hope I haven’t generalized too much or made it sound easy to engage students in areas they’d rather avoid. It’s not easy. But if it works, if you can really hook them you get to be a part of a wonderful transition that can, quite literally, change lives. For more information, visit our page about reluctant readers. 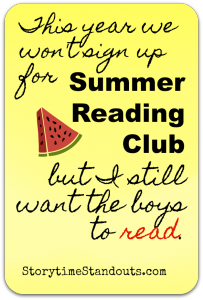 No summer reading club – but I still want the boys to read! When the boys were younger, we always joined out local library’s Summer Reading Club. Each evening we recorded the books we’d read that day and once a week we stopped by the library. In addition to enjoying some great books, the boys were rewarded with stickers, praise and medals. We all agreed that this year we won’t sign up for the library’s Summer Reading Club but nonetheless I intend to take them to the library once a week during July and August. Friday, the first day of our summer holiday, we ventured into the main branch and the vast children’s section of our local library. My eldest boy was soon engrossed in a book about World War II. My youngest boy was equally engrossed – he was watching other kids play computer games online. With both kids occupied, I scooped up an armload of books – I was determined to find some for my nine year old even if he didn’t want to look. I picked up a little of this and a little of that – some short mystery stories for him to solve (these can be great for reading comprehension because usually, kids have to be read very carefully if they hope to pick up on the critical clues), some ‘how to’ books (do I really want to build electrical circuits and make stuff from paper mache this summer? ), Nick magazine and Pirateology. Friday night we had a look at Pirateology and yesterday the two boys read each other mysteries and tried to figure out who did it. Some children can easily deal with the library environment. They know what they want and how to find it. For some children, there are too many distractions and too many books. As well, we often focus on chapter books and ignore information books. 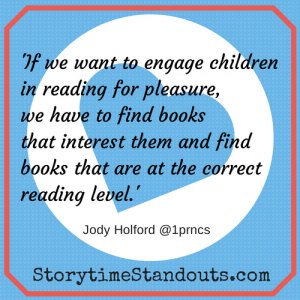 Don’t give up on getting kids to read – stay involved and make suggestions. I’m learning that I will need to cast a wide net if I want to keep both of my kids reading this summer.